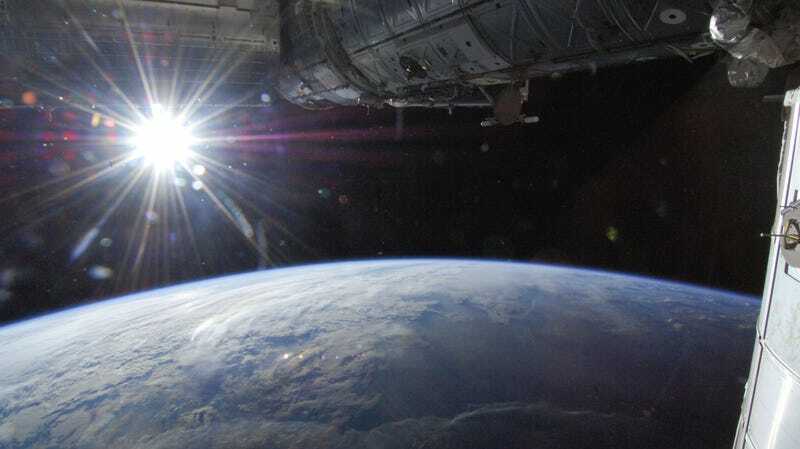 The Sun and Earth, seen from the International Space Station. All-time heat records have been set around the world this week, in North American cities including Denver, Colorado; Burlington, Vermont; and Montreal, Quebec; as well as in cities in Europe and Russia. But here’s something that might confuse you: Today is also aphelion day—the day in Earth’s orbit that where it’s farthest from the Sun. What gives? The Earth travels in an ellipse around the Sun. At its farthest point, which will occur today, July 6 at 12:46 pm EDT (9:46 am PDT), the Earth will be 94,507,803 miles (152,095,566 kilometers) away from the sun. On average, it’s around 93 million miles (150 million km) from the Sun, and on January 3, 2019, it will be 91,403,554 miles (147,099,761 km) from the Sun. The Earth is tilted at a 23.5 degree angle in its orbit around the Sun. That means during June and the surrounding months, Earth’s northern half points at the Sun, and during January and its surrounding months, Earth’s southern half points at the Sun. During March and September, the sunlight hits both hemispheres equally. The more direct the sun’s rays, the more light reaches Earth per unit area. Think about holding a bunch of straws, where each straw is a ray of sunlight, and trying to fit them into the glass, the Earth’s surface. If your glass’ rim lines up with the straws, more of them will fit than if you hold the glass at an angle to the straws. More straws, more rays; more rays, more energy; more energy, more heat. But you can’t leave climate change out of it. As things trend warmer, we can expect to see oppressive heat waves like these more often. And we do—2015 was the second-warmest year on record, 2016 was the warmest year on record, and 2017 was the third-warmest year on record, according to NOAA. Update, 11:50AM EDT: Someone on Twitter pointed me to another interesting fact—the entire Earth is hotter during aphelion. It’s actually true that the sunlight is a little bit less intense when the Earth is farther from the Sun, perhaps 7% less, according to an old NASA document. But there’s a lot more land in the Northern hemisphere, and land generally heats up more easily than water (it has a lower heat capacity). Even though the Earth is closer to the Sun in January, that heat is spread over the harder-to-heat ocean. Also, as astronomer Kelly Lepo from McGill pointed out to me, I left out another important fact—the days are longer when the axis is tilted to the sun, more time for the Earth to receive the energy from the rays and get hotter. Will Your Summer Be Uncomfortably Hot?